The rapid spread of the Buzzard is an amazing success story, from being one of the scarcest to one of the commonest raptors in the county in just a few years. The Atlas map shows that they are now absent only from the most built-up areas and the treeless coastal, estuarine and hill tetrads. Most birds were recorded in woodland (47%) or farmland (45%). 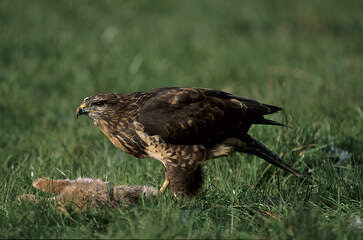 Buzzards feed in open fields or in woodland and mostly take small mammals, especially rabbits, but also catch birds and reptiles, actively flying after relatively slow-moving prey or taking recently-dead carrion. They also walk or run and, especially on bare ground, Buzzards take large numbers of beetles and earthworms. There is no shortage of food for such a generalist feeder and their breeding population does not fluctuate annually as does that of the vole-specialists. Buzzards have always been common in Wales, and have undertaken a substantial eastward range expansion starting in the late 1980s. The increase nationally has been associated with improving nesting success, perhaps through reduced persecution and a resurgence in rabbit numbers as their population stabilised with myxomatosis (Clements 2002). In our First Atlas, there were 2 tetrads with confirmed breeding and 10 with possible breeding from the seven years of fieldwork (1978-84). As their numbers in Cheshire and Wirral were obviously increasing, two surveys were organised by CAWOS and the Cheshire & Wirral Raptor Study Group: in 1994 there were 5 confirmed and 14 probable breeding pairs, in 18 tetrads, and the rapid growth of the population was shown six years later, when the 1999/ 2000 census found 56 confirmed and 128 probable breeding pairs in 145 tetrads (Barber & Hargreaves 1999). With a long breeding season from display in March to fledging in July, a large nest and a common bird, it is not surprising that fieldworkers found nests in 85 tetrads. A characteristic behaviour of nesting Buzzards is to decorate the nest with green leaves, usually visible from the ground and a sure sign of an occupied nest. Adults were seen carrying food for their young in a further 24 tetrads, but the most common method of proving breeding, in 101 tetrads, was RF – surveyors seeing recently-fledged chicks with their parents, who regularly feed their chicks for up to two months after they leave the nest. Most broods are of two or three chicks, the average apparently decreasing as the population has grown and the productivity of each pair has dropped. Most of the 220 records of probable breeding came from observers recording pairs, or display, which was the main method of counting during the 1994 and 1999/ 2000 surveys. The BTO BBS analysis shows that the population of Cheshire and Wirral in 2004-05 was 1,650 birds (710-2,600). Buzzards do not normally breed until three years of age, so perhaps half of the birds seen were non-breeders, and that, with the BBS counts in early mornings in April and May, only one bird was seen from each pair of Buzzards, this figure would give a county population of 835 pairs which is perhaps a reasonable upper limit for the current estimate. Such a total corresponds to 2 pairs per tetrad with confirmed or probable breeding, an average density of 0.5 pairs per km2. How does this compare with other figures? The prime habitat of the New Forest in the 1960s supported Buzzards with a mean territory size of 0.55 km2, equivalent to 1.8 pairs per km2 (Tubbs 1974). In a 75 km2 study area of north Somerset, Robin Prytherch found that Buzzards increased from 13 pairs in 1982 to 84 pairs in 2001, over 1.1 pairs per km2 (quoted by Clements 2002). In the 1999/ 2000 survey of Cheshire and Wirral, the area of greatest breeding density, covering 160 km2, held an average of 0.22 pairs per km2 (Barber & Hargreaves 1999). As the population grows, the birds’ territory shrinks, they tend to nest closer and closer together and produce fewer young per pair until eventually equilibrium is reached. That has not yet happened in Cheshire and Wirral and another survey in a few years’ time would be worthwhile.